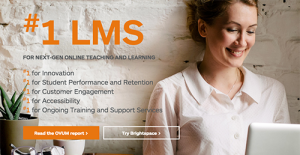 Easy, flexible and smart, Brightspace helps you deliver a personalized learning experience backed by powerful teaching tools, an easy-to-use interface, and integrated analytics. With the solution, designing effective courses and creating engaging content has never been easier. With rubrics to easily evaluate activities based on a predefined set of criteria, Brightspace makes it easy to develop effective assessments. You can use different pedagogical approaches including competency-based education and game-based learning so you can teach the way you want. At the same time, Brigthspace is a well-integrated system that operates seamlessly with Google Apps for Work and Microsoft Office 365, while it also offers Learning Tools Interoperability integrations with third-party service providers. The pricing scheme is very flexible, as every user receives a quote that has been specifically tailored in accordance with his needs and expectations. Create engaging content. Create new course content with help from HTML editor and built-in content templates. Add inline multimedia, links, or custom LTI tools directly into course content with the Insert Stuff tool. Develop effective assessments. Measure progress in a variety of ways including quizzes, surveys, and assignments with optional TurnItIn® integration. Create, share, and reuse a common set of assessment questions with support for third-party QTI files. Simplify class administration. Send news, updates, and announcements to learners through a homepage widget, email, calendar, SMS, and/or RSS feed. Companies have different needs and requirements and no software solution can be perfect in such a scenario. It is useless to try to find a perfect out-of-the-box software product that fulfills all your business needs. The smart thing to do would be to customize the application for your special wants, staff member skill levels, budget, and other aspects. For these reasons, do not hasten and subscribe to well-publicized popular solutions. Though these may be widely used, they may not be the best fit for your particular needs. Do your groundwork, investigate each short-listed platform in detail, read a few Brightspace reviews, contact the vendor for clarifications, and finally select the app that presents what you need. How Much Does Brightspace Cost? Brightspace’s SMB and enterprise pricing information is available only upon request. Contact the company for more details, and ask for your quote. We realize that when you make a decision to buy Learning Management System - LMS it’s important not only to see how experts evaluate it in their reviews, but also to find out if the real people and companies that buy it are actually satisfied with the product. That’s why we’ve created our behavior-based Customer Satisfaction Algorithm™ that gathers customer reviews, comments and Brightspace reviews across a wide range of social media sites. The data is then presented in an easy to digest form showing how many people had positive and negative experience with Brightspace. With that information at hand you should be equipped to make an informed buying decision that you won’t regret. What are Brightspace pricing details? What integrations are available for Brightspace? If you need more information about Brightspace or you simply have a question let us know what you need and we’ll forward your request directly to the vendor.